Suitable for dry material of reduced hardness, for the production of final products with particle sizes from 0,1 to 10 mm. 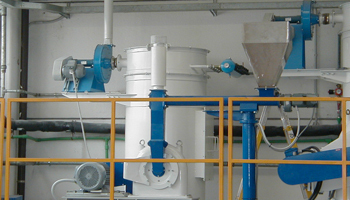 Very often used for general purpose in the animal food industry, for example as a pre grinding mill prior to a second grinding by other means and methods. The grinding is achieved by the material impact on the grinding tools, mounted to the grinding disc (fixed or oscillating), and the grinding track, which could be a sieve or partially a solid grinding track of special design. 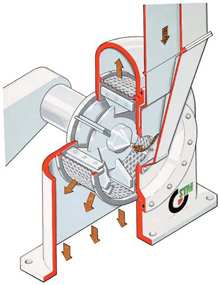 The sieve acts like a classifier as it determines the particle size according to its hole diameter. Consequently the final particle size depends on the sieve hole diameter and the number of revolution of the wheel. Available with a wide range of accessories and different grinding disc designs of various material suitable for virtually every purpose.